Distressed furniture has decorative appeal, especially when you're going for a shabby chic-style or country look in a home. Instead of buying furniture already distressed, to save money, scour thrift shops, consignment and even secondhand stores. Refinish your finds or your existing furniture to give it an age-old distressed look. Any mistakes you make add to its appearance. Choose from one of several methods to distress furniture to match your home's interior design. before you begin so that the paint adheres properly. 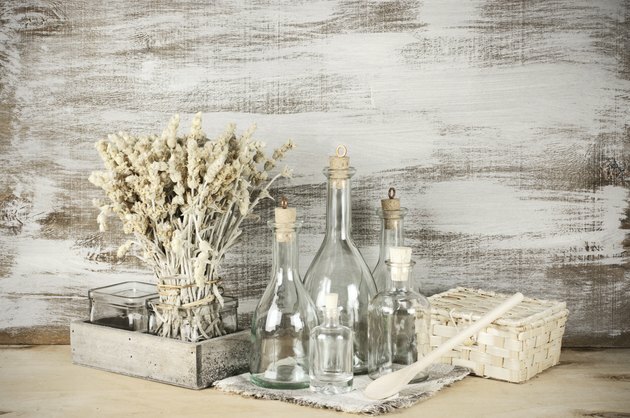 Add splotchy milk paint to create distressed shabby chic look on wood. 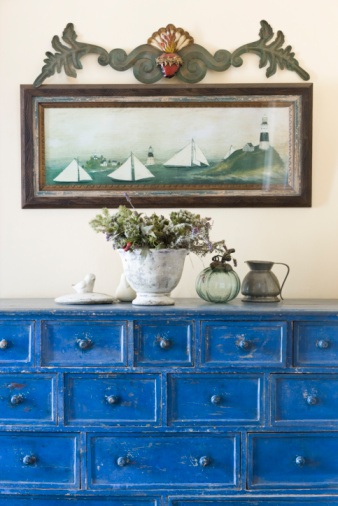 If you have a piece of furniture that was painted more times that you can count over the years, the paint stripper method removes some of the layers of paint to give the piece a finished distressed look. Set the piece of furniture in a well-ventilated area in the garage or outside, and wear the appropriately labeled safety gear for the task: gloves, goggles and face mask. Apply the stripper to the furniture item with a brush, covering its entire surface. After you notice the paint starting to bubble, scrape off the stripper with a putty knife in some areas, while removing it with a rag in others. The number of paint coats determines how many times you apply the stripper to remove paint layers for the desired look. Apply latex paint to the surface of the finished wood with a dry brush. The idea behind the dry brush method is to allow some of the original surface of the furniture's finish to show through. Don't cover the piece of furniture entirely with paint, allowing the brush to drag paint along its surface, missing some spots intentionally. This method works on most surfaces, including laminated, wood, stained or lacquered furniture as long as you scuff up slick surfaces a bit with a light sanding. You can create the shabby chic-style look with powdered milk paint in your favorite pastel shade. Mix the milk paint with water, following the manufacturer's instructions on the package label. Make certain to mix it thoroughly with a stirrer fitted to a power drill so no lumps remain in the paint. On a preconditioned unfinished wood surface or over a previously finished surface, paint the entire furniture item with the milk paint, covering it completely. Once dry, use a sanding block or sandpaper to remove the paint erratically and randomly across the surface to create the distressed look. Milk paint works on wood stained surfaces or even previously finished glossy surfaces, as long as you lightly sand shiny surfaces before beginning. If you have a newer piece of furniture that doesn't look as old and worn as you want, , but strong enough to leave dents or the imprints of the etching on the hammer head's face. A wood chisel creates gouges, while setting a nail horizontally on the surface and tapping it lightly with a hammer creates distinct indentations. Textured hard surfaces leave interesting marks on the furniture. You may leave it as-is when you have created the look you want, or cover the piece with the milk-paint method, dry-brush technique or the stripper method. Prepare unfinished wood with a wood conditioner to help it absorb stain; cover it with the stain color of choice and let dry. It doesn't matter if the stain looks blotchy, as that will just add to its appeal. After the stain is dry, cover it with milk paint or use the dry-brush method to give it a distressed look. If you used milk paint, sand very lightly to avoid removing all the stain and paint. You can also use a putty knife or other scraper in place of sandpaper or a sanding block.